Earnings • Retailer's performance also hurt by sluggish sales, botched Canadian expansion. New York • Target Corp. slashed its annual profit outlook for the second time in three months as the retailer continues to reel from costs related to a massive data breach, a botched expansion in Canada and sluggish sales in the U.S. The nation&apos;s third-largest retailer also said Wednesday that its second-quarter earnings dropped 61.7 percent. Excluding expenses related to the data breach, the results were a penny short of Target&apos;s reduced estimate issued earlier this month. The reduced forecast comes three weeks after Target named PepsiCo executive Brian Cornell as its new CEO as the retailer fights to redefine itself to American shoppers. The latest results highlight the challenges that Cornell, who officially started Aug. 12, faces on all fronts. He must wrestle not only with problems specific to Target, such as restoring the discounter&apos;s magic as a cheap chic fashion purveyor. But he also must address broader challenges facing the economy and the retail industry in general. While most of Target&apos;s low- to middle-income shoppers have moved beyond the data breach, they remain cautious about spending in a tough environment. In fact, Target, which ramped up promotions in the first quarter and scaled back the discounting tempo in the second quarter, said it still had to cut prices more than originally expected in the latest period. That environment has also tripped up rival Wal-Mart Stores Inc., which lowered its annual profit forecast last week amid sluggish sales. Target and other retailers also face a shifting landscape where shoppers, looking for convenience, are moving away from physical stores and researching and buying on their PCs and mobile devices. That has contributed to traffic declines at Target and other retailers. In his first earnings conference call as Target&apos;s new leader, Cornell told investors Wednesday his top priorities are turning around the U.S. business and Canadian operations as well as pushing Target to move faster in innovations in digital shopping. He said he just returned from a trip to Canada and said that he plans to spend time listening to employees. But he emphasized there&apos;s no time to waste. "I want to be a good student of the business," he said. "But clearly, we have a sense of urgency here and a sense of pace." Cornell is the first outsider to take the helm at Target. He replaces Mulligan, who was named interim CEO when Gregg Steinhafel resigned in early May in the wake of the data breach that compromised the credit card and personal information of millions of customers and exposed big security flaws. Mulligan told reporters during a call that Target plans to return to a more normal pace of discounting and focus on attracting shoppers by offering more exciting products. To that end, Target is revamping its beauty and baby departments and is also planning to increase its offerings of trendier fashions. Revenue at stores open at least a year up moved into the positive territory for six weeks in a row, a period that includes a bulk of the back-to-school shopping season. The figure is considered a key measurement of a retailer&apos;s operating performance. 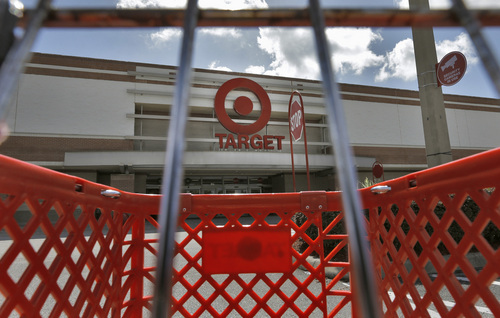 Target also faces the lingering effects of the breach. The company has responded by overhauling security and technology. The company incurred breach-related expenses of $148 million, partially offset by the recognition of a $38 million insurance receivable in the quarter. As for Canada, the company is overhauling its business under new management. In fact, 30,000 of the 70,000 items stocked in a typical Canadian store will be new by the holiday season. Target&apos;s shares rose 1 percent, or 67 cents, to $59.92 Wednesday. The shares, excluding Wednesday&apos;s performance, have lost nearly 13 percent of their value over the past year.